Three water features, providing sustainable environments, were inspired by the Cedar River Aquifer flowing beneath the site, offering respite for emergency workers in the facility. The artwork was developed in response to workers who said, “All we want is to hear the sound of water”. The RCECC facility houses the King County Sheriff’s Office 911 Communications Center and the King County Office of Emergency Management. 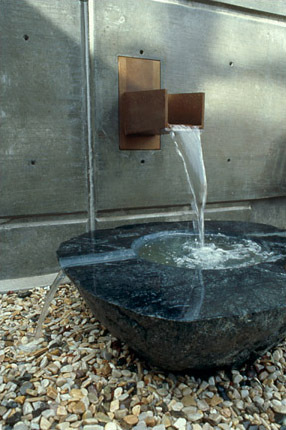 At the entrance to the building, rainwater is harvested from the roof and released to the aquifer below through a bronze scupper and granite basin. A bubbling water table is encircled by stone seating in a zen courtyard creating a calming environment for emergency workers. Scuppers harvest water from the roof, releasing it to a meadow at the rear of the building.